Obituary for Andrew M. Sluka | Clawson Funeral & Cremation Center, Inc.
On Wednesday, April 10, 2019, Andrew M. Sluka entered heaven with a strong back and clear eyes. A son of the late Steve Sluka Sr. and Pauline (Burlando) Sluka, he was born April 21, 1930 in West Leechburg, PA. He would have celebrated his 89th birthday and 63rd wedding anniversary in 11 days. Andrew had been employed as a water tender by Allegheny Ludlum in West Leechburg for 44 years retiring in 1992. He was a veteran of the U.S. Air Force having served during the Korean War. Andrew was a member of Christ the King Parish in Gilpin Twp. where he was a member of the church choir. He was also a member of the Alle-Kiski Chapter of the Barber Shop Quartet. 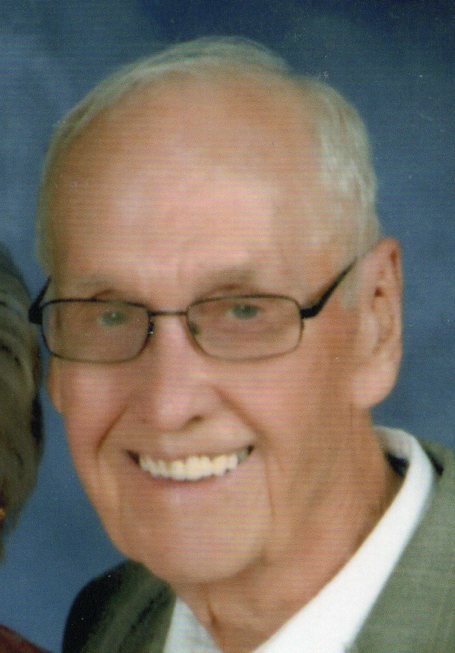 Andrew enjoyed walking, gardening, watching all sports (especially the Pittsburgh Steelers), solving crossword and Sudoku puzzles, and attending his grandchildren’s sporting and music events. Survivors include his beloved wife of 63 years, Adele (Sober) Sluka of West Leechburg; a son, Christopher Sluka (Dusty) of New Kensington; two daughters, Beth Shepler (Hal Luebbe) of West Leechburg and Jane M. Nemeth (Alex) of Vandergrift; eight grandchildren: Emily Lowes (Ryan), Allison Mallin (Dan), Caroline Shepler, Megan Cadwalder, Molly Adams, Aaron Sluka, Jack Adams, Corin Sluka; five great-grandchildren; a sister, Catherine Sluka of Apollo; and a sister-in-law, Mary Sluka of Alabama. In addition to his parents, he was preceded in death by a brother, Steve Sluka Jr.
Friends welcomed by his family on Friday, April 12, 2019 from 4-8 p.m. at Clawson Funeral & Cremation Center, 170 Main Street, Leechburg (724-842-1051). Parting Prayers of Transfer will be held at 10:15 a.m. on Saturday, April 13, at the funeral home, followed by Mass of Christian Burial at 11 a.m. at Christ the King Parish, 125 Park Road, Gilpin Twp., with the Rev. James H. Loew, O.S.B. officiating. Interment following at St. Catherine Cemetery, 614 Evergreen Road, Gilpin Twp.